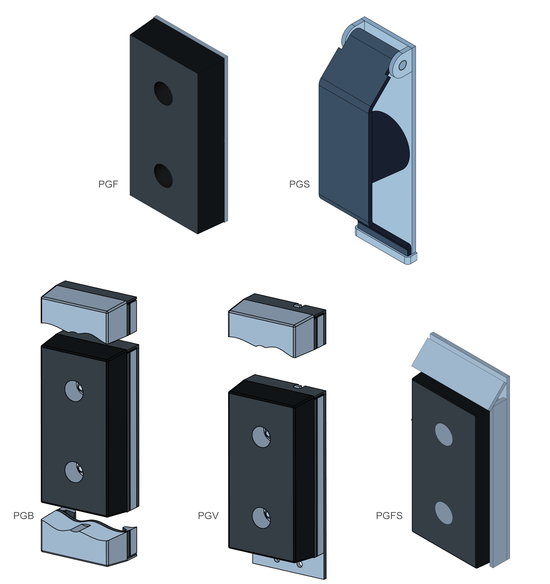 The PBGP products are standard low-cost high-quality rubber buffers with a high resistance to wear and tear. All rubber elements are made of high-quality new rubber material ensuring a long service life.The rubber elements are available in 90 mm and 140 mm thickness. PGF 90 and PGF 140 are designed for extremely high impact forces hence ensuring a long service life. The rubber elements are available in 90 mm and 140 mm thickness. For higher impact loads buffers with a protective housing are recommended. The sloped protective plate prevents the buffers from being heavily damaged. Thanks to the lateral flat steel guides the fixing bolts of rubber buffers are optimally protected against shear. The rubber elements are available in 90 mm and 140 mm thickness. Spring-steel buffers provide optimum protection for heavy-duty loading and unloading. These buffers stand out for their excellent shock-absorbing characteristics, maximum resistance to wear and long service life. During loading/unloading only the buffer steel plate gets into contact with the vehicle. Thus, normal tear of the surface caused by the vehicle’s height movements is excluded. Costly buffer replacement is avoided and operating costs are reduced. Spring-steel buffers are either welded to the frame or dowelled to the leveller. These buffers have the highest possible durability. They follow the lorry’s vertical movements by 150 mm upwards and 150 mm downwards so that the buffers’ wear is almost reduced to zero. These buffers are used for loading and unloading of vehicles whose lorry beds are higher than dock level. Height-adjustable buffers can be lifted by up to 250 mm above dock edge. During loading and unloading the buffer adjusts to the lorry’s vertical movements. It moves up to 50 mm upwards and 250 mm downwards. Thus, the buffer’s wear is reduced to minimum and its durability is extended. After docking the buffer can be fixed at dock level so that the lorry tailgates can be opened. The rubber elements are available in 90 mm and 140 mm thickness.